Highlight your best features in a minute! To makeup addicts and enthusiasts alike, contouring is one of the most important tricks to master. Nearly everyone is familiar with the concept of contouring, but strobing or highlighting, not so much. So what's the real difference between the two? Strobing and highlighting are contouring's easy-going and carefree cousins. The difference is simple—the former is done alone, while the latter is coupled with contouring. For both, however, key is highlighting the high planes or points of your face that catch light to bring out and accentuate the right features. What's great about strobing is that it lends you a natural-looking glow with just a few strokes—sans the heavy, oily feeling that everyone hates. Of course, beauty-obsessed girls have been using highlighters and SLAYING at it for what feels like ages already. 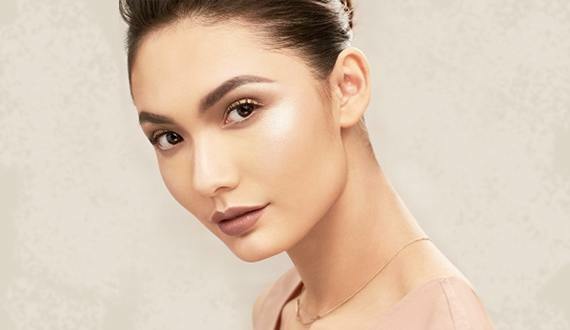 With the summer season fast approaching, Maybelline has you covered if you want to make the most of this highlighting technique, especially if you're a beauty rookie. Maybelline Master Strobing Stick lights up your face with just a couple of easy strokes. It's the first illuminating strobing stick that creates a targeted glow for a dimensional look in seconds. 1. Start with the cheeks. Add dimension to your face by applying the Master Strobing Stick to the high points of your cheeks. 2. Proceed with the eyes. Give your eyes a little bit of ~*illumination*~ by highlighting the brow bone then follow that quick swipe with a little dab on the inner corners of your eyes for a natural dewy glow. 3. Follow it up with the center of the face. Start by highlighting the bridge of the nose, give your cupid's bow a pat, and end with a light dab on the chin. Finally, blend it all in and flaunt your effortless glow. That's it! So this summer, step into the spotlight and look naturally sun-kissed with a little help from Maybelline's Master Strobing Stick! And if you're aiming for an all-over subtle sheen? Alternate the Strobing Stick with the Master Strobing Cream, the first ultra-bendable strobing cream that creates an overall glow for a dimensional look. Maybelline's Master Strobing Stick is available at Maybelline counters nationwide. You can also order online for only Php 399.00.